Due to limited and unsecured space at the clubhouse, The Windsor Hills Welcome Center does not accept deliveries of mail/post, parcels/packages, child strollers, wheelchairs, motorized wheelchairs or any other items. Guests and owners should coordinate rental and mail deliveries (this includes FedEx and UPS ) to coincide within their arrival and departure dates. Packages or deliveries sent to the Welcome Center will be declined and returned to sender. If pre-arranged, many of the rental companies will deliver directly to the home. Also you can pre -arrange for UPS to receive parcels for you at their Formosa Gardens store. It is about a mile from the community. Trash at Windsor Hills is picked up every day except Wednesday and National Holidays. Trash collection begins at 7:00 am, so put your trash out early in the morning INSIDE the bench mate located at your front door. There is no street side collection. Trash must be placed in a 13 gallon trash bag. No loose trash or liquids. • Next to the Children’s Playground on Dinville St.
• Corner of Archfeld and Teascone Blvd at the hilltop. Single Stream Recycling is available at the Recreation Area. Owners and guests are urged to deposit their recyclables from 8am to 10pm daily. We have a NO SOLICITING policy and this will be strictly enforced. Any vendor found to be placing flyers will be banned from the community.Any one witnessing the distribution of flyers is requested to immediately phone the office at 407-787-4255. Visitors (including family and friends) will be allowed into the resort if the owner/guest contacts the front guardhouse. The front guardhouse can be reached at 407-397-1464. Please contact the guardhouse for food deliveries as well. Each home is designed to sleep a certain number of people due to fire code.This typically means two people per bedroom, including children. 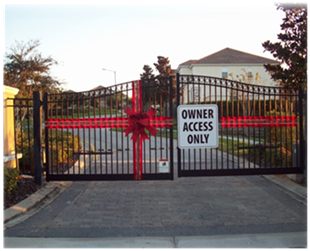 Every properly licensed home has a certificate showing the total occupancy permitted by law. Over crowding of homes is prohibited and violators will be evicted. All owners and guests must notify Security(407-397-1464) of any food delivery orders they made and the company involved. Any delivery not notified to the guards and without a contact phone number for customer will be denied access. 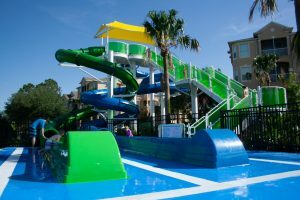 Windsor Hills is a family oriented resort style community and we have designated “quiet time” between 11pm and 7am. Please respect this policy and remember to keep the noise down,particularly in the open area sat night. 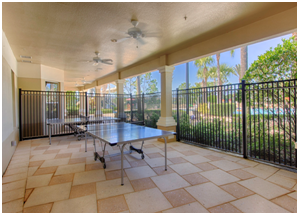 Noise from talking and music around your pool area and else where carries a long way in the mild Florida climate. Excessive noise and events of concern can be reported to the Osceola Sheriff’s Office at 407-348-2222 and they will settle the issue. • Vehicles may park on the road for loading and unloading purposes. • Vehicles servicing a home may park on the road for a short time. • The community has a speed limit of 25 mph through out. • Vehicles are not permitted to park on road or side walk sat the express request of the emergency services.The community roads are quite narrow and not designed for street parking. It can be very dangerous for pedestrians when vehicles are parked on sidewalks. • Vehicles that can’t park on the home’s drive must park in the oversize car park. • Offending vehicles will be towed at the driver’s expense if the driver ignores the request to move. • Boats, trailers,commercial vehicles,oversize vehicles and campers are not permitted to park on drive ways or roads.We have an oversize vehicle park close to the tennis courts.A permit is required which is available from the Gate house.This permit is time limited and free. All vehicles with a trailer attached should use the front gate. • Over night camping is not permitted in the oversize car park or anywhere on there sort. • RV vehicles must be parked in the oversize car park and under no circumstances may they be used for over night sleeping arrangements. • There is a 2 car maximum per property address. Exceptions must be entered into DwellingLive. • Do not block sidewalks and do not park on the streets or grass. • Single-family homes can hold up to 2 vehicles in the driveway. • Townhomes can hold one vehicle in the driveway. 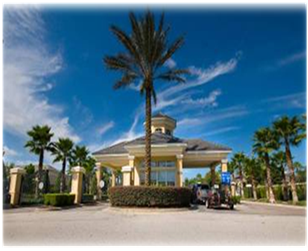 • Condos have their own parking spaces located in front and around the buildings. • Additional parking is available in the oversize parking lot off Comrow street (next to the recreation park) and in front of the clubhouse. a. Obtain an oversize parking permit at the front gate. b. Display the permit on the vehicle. c. Park at the oversize parking lot. Inform the guard house if you are expecting any deliveries or guests- guests must be registered. Upon arrival you will be issued a Guest Pass for the duration of your stay. Only a registered guard will issue this pass. 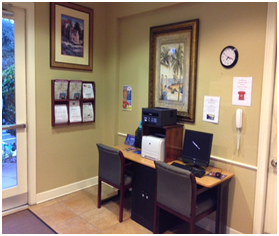 See reception team at the Welcome Center to obtain the code for the entrance into the amenities. All of the amenities are free to use for guests. 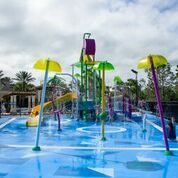 • Visit the Welcome Center – hours 8am-10pm for your code to enter the amenities. we are a resort where guests love to unwind and relax, but we are a family community and ask that you are respectful of your neighbors and adhere to the quiet hours of 11pm. If for any reason, you are disturbed with loud socializing and you feel that your quiet hours have been abridged, you are welcome to call the Sheriff at 407-388-2222. Come on over to Market where you can buy basic grocery items for your stay at Windsor Hills. Open 7 days a week, the hours of operations change seasonally. Summer Hours are 8:30AM – 8:30PM, Winter Hours are 8:30AM – 8:30 PM. 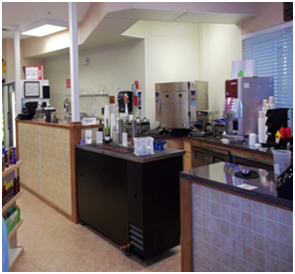 Enjoy fresh sandwiches, wraps, salads, assorted beverages, newspapers, and fun pool items. The Cyber Café is located in the Welcome Center. Printing, copying, faxing and scanning services are available. Computer time is limited to 30 minutes. Printing charges apply. Ping Pong is located right beside the pool. Equipment is available to rent at the Welcome Center for a $1.00 fee and a $10.00 refundable cash deposit. 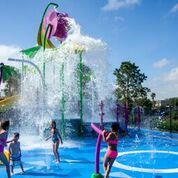 Orlando is busy year-round due to its theme parks and consistently warm, sunny weather. Peak season is during U.S. spring break weeks (Mar–Apr). Other especially popular times are Jun–Aug and Nov–Dec. Summers can be quite hot and humid. Along with the Florida Film Festival (Apr), Epcot’s annual flower festival (Mar–May) and food festival (Sep–Nov) attract visitors.